What did you like about the book? Three folktales from Latin America are rendered into graphic novel form is this attractive addition to the Toon library. Included are “The Dragon Slayer,” a classic tale of a youngest sister who must be strong and clever to survive; “Martina Martínez and Pérez the Mouse,” by Alma Flor Ada, about a young woman whose husband, a rat, falls into the soup, and his eventual rescue; and “Tup and the Ants,” about a lazy youngest son who ends up being the luckiest son of all. I like that the book is imbued with images and patterns from Latin American art, and includes historical backgrounds of the tales. Campoy’s introduction, and the tales’ origins and bibliography, including art reproductions, in the back matter, combine to enrich understanding of the culture of these strong heroines and heroes. Hernandez’s vivid illustrations make the tales modern, relatable and universal. To whom would you recommend this book? For kids ages 6-10 who like folktales or who enjoy the Toon series of graphic novels. Should we (librarians/readers) put this on the top of our “to read” piles? 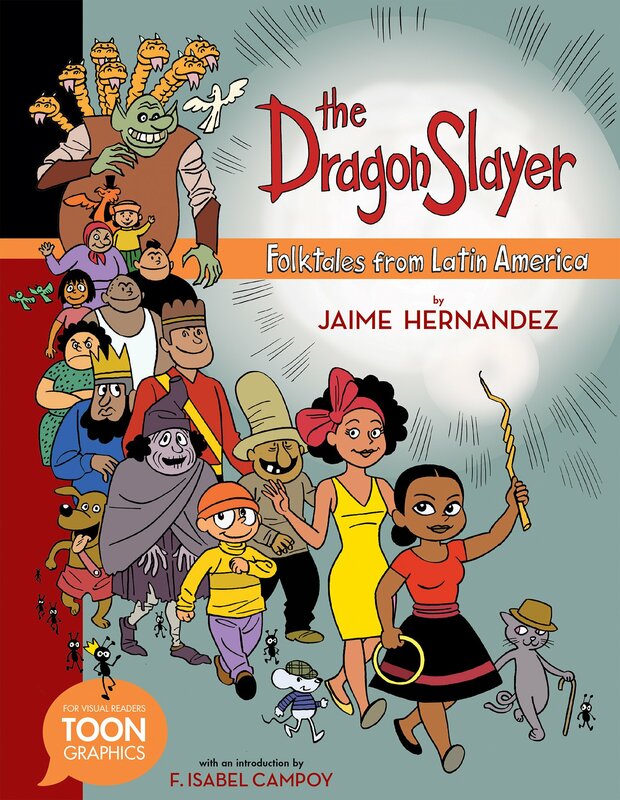 If you are curious about how Jamie Hernandez’s work translates to children’s books, take a look. This entry was posted in Book Review, Folk Tale, Graphic novel and tagged Toon Books, Toon Graphic. Bookmark the permalink.